One of the greatest things to happen to us Celiacs living in New York are the many frozen yogurt places sprouting up on practically every street corner. 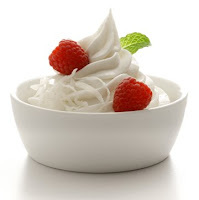 Although, some of the toppings are not gluten free they are all offering an assortment of fresh fruit to place on top of frozen yogurt flavors such as original, coffee, green tea, and pomegranate, amongst others. Some places that I've recently checked out are 16 Handles, Pinkberry, and Red Mango. Not only is this a delicious treat but it is relatively healthy too. A great alternative to all of the treats that we consumed too much of over the holidays. Today Is National Chocolate Cake Day! Eat Some Good Organic Vegan Cuisine! Joan's GF Great Bakes Are GREAT! Time For A Weekend Update!